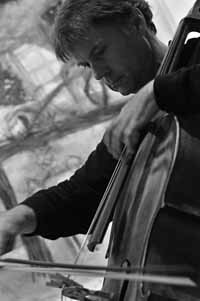 ULRICH MITZLAFF completed his cello studies in the seventies at Tübingen (Germany) with Professor Stefan Zarnescú. Since 1996 he lives at Lisbon, Portugal, where he works as cellist and composer of contemporary and experimental music, improvisation, free-jazz, conceptual composition and sound-art. He collaborates with various artists in multidisciplinary and electro-acoustic projects and he is member of the art-association “granular”. At the moment, he participates in music-projects like: the Duo Ulrich Mitzlaff / Miguel Mira, with a new and very surprising CD “Cellos” that was presented early springtime this year; Separados Frutos, an experimental music and spoken word formation with Nuno Rebelo, Vera Mantero and Manuel Guimarães; the Open Speech TRIO with Carlos Bechegas and Miguel Feraso Cabral; the Duo Carlos “Zingaro” / Ulrich Mitzlaff and the Fruit Music Quartet with Franziska Schroeder, Pedro Carneiro and Pedro Rebelo. With Carlos “Zingaro” he was performing in many different constellations and formations that had a significant impact on his playing. The same is to say about his collaborations with Nuno Rebelo, Carlos Bechegas, Miguel Mira and Carlos Santos. He was interpreting the original music composed by Nuno Rebelo in 2001 for “como rebolar alegremente sobre um vazio interior”, choreography by Vera Mantero for the Ballet Gulbenkian, and in 2003 for “Silicone Não”, choreography by Paulo Ribeiro for the Companhia Paulo Ribeiro. He was collaborating in 2000 and 2001 with Américo Rodrigues in his multi-dimensional piece “…como um relâmpago…”. He composed and presented live in 2008 the music for the choreography created by Romulus Neagu “The Invisibility of the Small Perceptions”. With Romulus Neagu he works also in the duo “ImproFormance”, an instant dance-performance. In 2008 he created and interpreted the music for the documentary film by Miguel Clara Vasconcelos over the choreographic project of Romulus Neagu “The Invisibility of the Small Perceptions”, and in 2009 he composed and interpreted the music for the dramatic short film by Miguel Clara Vasconcelos “Pedrinez”. He interpreted the original music written by Paulo Curado for the animation film “Cândido” by “Zepe” – José Pedro Cavalheiro in 2007. He participated in many international festivals like “Festival LEM Primavera” (Barcelona 2009), “Festival Portugal and the World” (Brussels 2007), “Metasonic LX” (Lisbon 2006), “Metasonic III” (Lisbon 2010), “Festival Músicas do Mundo” (Sines 2006), “Festival Alkantara” (Lisbon 2006), “Sonorities” festival of contemporary music (Belfast, Northern Ireland 2005), “CAMP 03 - international festival for electronic music, sound art and visual arts” (Tübingen, Germany 2003) and “CAMP 05” (Montemor-o-Novo 2005), “Encontros de Música Experimental- EME” (Setúbal 2000 and 2001), “Ó da Guarda” (Guarda 1999, 2005 and 2008) among many others. He was playing in various concerts with Fried Dähn, Rodrigo Amado, Emídio Buchinho, Reinhold Friedl, Vitor Joaquim, Thomas Maos, Stefano de Bonis, Josep-Maria Balanyà, Bart Maris, Miguel Cardoso, Pedro Lopes, Hernâni Faustino, Stefano Zorzanello, Gregg Moore, Liba Villavecchia, Paulo Curado, Bertrand Gauguet, Miguel Leiria Pereira, Ernesto Rodrigues, Mark Whitecage, Phill Niblock and many others. He worked in the duo I/O with Carlos Santos (MAX/MSP) in the field of electro-acoustic improvisation and he was collaborating with the Lisbon Improvisation Players of Rodrigo Amado.